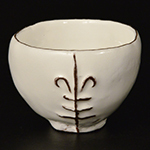 1990 Graduated from the Aichi Prefectural Set Yogyo High School Ceramic Art Advanced Course. 1992 Hold solo exhitions in Japan and overseas. 2003 Published a photo album titled UCHIDA KOICHI.